Just to let you know I passed my driving test yesterday, I'm so happy. Thank you so much for helping me achieve what I thought was unachievable. Through hypnotherapy Julie has changed my 10 year olds life, up until now he's been unable to sleep on his own or through the night. He now goes to bed with no fuss and sleeps all night, something we thought would never happen. Ben had suffered from terrible anxiety unable to leave the room, play in his own garden or even go to the toilet without someone going with him. Julie succeeded where numerous doctors and professionals failed. Thanks to hypnotherapy with Julie Ben is now a much happier confident little boy. ...Sorry I've been a bit slow to contact you, our holiday was amazing! Being able to snorkel just made it for both of us, I was surrounded by fish with no panicking, Ryan couldn't believe it. 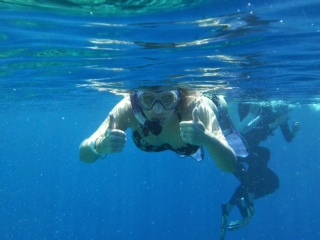 I jumped in from the boat saw sharks, a turtle & we even got the chance to swim with Manta rays out at sea! It really couldn't of been any better, thank you. Lots of people have been asking about hypnosis so they might be heading your way. Being the ultimate sceptic, I was persuaded to give Julie a try. After 48 years of wrestling with the effects of a bad childhood I was completely amazed at the transformation that has occurred in me. Julies sympathetic, compassionate and professional approach puts you at ease and miraculously melts away your issues. I once described myself as a butterfly in a lions cage – I am now the lion! Healed, at our with myself and empowered. I owe all my gratitude to an exemplary therapist in this profession. Heartfelt thanks from a delighted client – no longer a sceptic! Julie has transformed my way of thinking and helped me put the negativity from my past behind me, so I can look towards the future with a better view. Her extensive knowledge and experience is obvious – along with great dedication and creativity to get around my problem. I always knew Julie could help no matter what it was! Julie has helped me to live a fuller life and realise my potential so I can go ahead and achieve what I thought had to be put on hold. With Julies help, I can cope with any new obstacles and I can do anything! Thank you!! My appointment began with a chat about my fears and phobias and a brief medical consultation. I was also asked about any recurring dreams and had to describe my ideal holiday. Then I lay back on the couch to begin the therapy. During hypnotherapy, contrary to popular opinion, you remain fully conscious and aware of sounds inside and outside the room. I was asked to focus on a spot on the ceiling and looked up then down a couple of times before closing my eyes. Julie helped me to relax my muscles one at a time then was invited to visualise a scene. Julie’s relaxing voice talked me through the sights that would be around me in this scenario and asked me to imagine a walk whose final destination (down some steps) was my childhood bedroom. Through visualisation of happy childhood days, specifically a time when I was public speaking with confidence the idea was to hold onto that moment and the pleasure and confidence it en-captured. I could then relive that confidence as an adult faced with situations requiring public speaking. At the end of the session I was quite slowly brought back out of the hypnotised state as Julie counted me up the steps and back to my original destination. So has it worked? I have booked a second session in a month’s time as a boost and I hope to give a talk about my business at my local business networking group, something that I would not have considered previously. I certainly feel more confident already and feel that this brief hypnotherapy session has enabled me to have a more positive outlook on my life and my business. Hypnotherapy can be used to treat a wide range of problems which can sit in our subconscious and can lead to physical or mental illness until explored or released. It is commonly used to help smoking cessation, fear of public speaking, to build self confidence, for examination nerves, weight control or to boost sports performance. It can treat phobias, depression, eating disorders, and IBS relieve stress or pain. We all have something that makes us fearful or that we would like to overcome. If you would like to face your demons and get on with living your life to the full give Julie a call.